You go to the vineyard and sign in at 6 a.m. You start work right away. Others come in and begin at 9, at noon, and four p.m. At the end of the day, you all get paid the same. The boss tells you take it or leave it. You work your way up the business ladder expecting promotions. Then, one day you overhear, “In my rules, the last shall be first, and the first shall be last.” Little did you suspect such prejudice. You consult a charismatic wise man respected as a god, who advises you to handle violence directed at you thusly: If someone hits you in the jaw, turn your face so he can hit you from another angle, and if he steals your coat off your back, don't neglect to give him your shirt, too. Forgive the guy who rapes your daughter. You've been a really good son; you've done everything to earn your father's respect, and nothing to cause him the slightest embarrassment. Are you recognized for this? Your lazy brother, whose gone off and spent his inheritance on drinking, drugging, whoring, and carousing, comes home, and your father welcomes him with open arms, and rewards him for returning, with a fabulous banquet. You go back to consult the wise man. He tells you to make no plans for the future. His father will take care of everything. Okay. So, you don't set aside money for retirement. No IRA nor social security for you. You trust in him, have faith. On his advice, you sell everything you have and give it away to the needy. Uh-huh. He's got you convinced to assault your mind every time you look on a woman with lust in your heart. You give him your absolute trust. He insists, to save your life, you must lose it. He convinces you that all your heart’s desires will be given to you, but first you have to die. You won't get those desires until after you're dead. And the best way to emulate your hero is by forcing others to kill you. You allow others to decide for you what the meaning of your life is, what you must believe, the choices and decisions for your own life and death. And after you've done all this and you're dead, guess what? 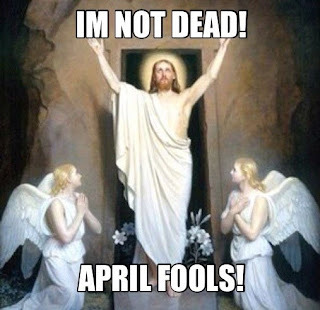 Ultimate April Fool! !